The government in Kenya has replaced almost all of the country's most senior police officers in what analysts say could be the start of major reform. Human rights groups blame the police for much of the killing that took place during violence that followed elections in 2007. 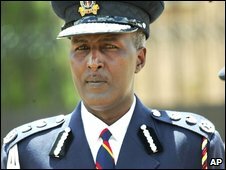 The changes go to the top - ex-police commissioner Maj Gen Hussein Ali has been moved to the Post Office. Human rights agencies have cautiously welcomed the changes. Of all the Kenyan institutions needing reform, the police have been at the top of the list. In the wave of reflection that followed the rioting over the disputed elections, the police were blamed for killing hundreds. A UN report published this year described the killings as systematic and carried out with total impunity. 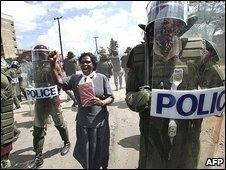 Human rights groups have consistently argued that there can be no justice in Kenya without complete reform of the police service. Tuesday's announcement seems to answer that call. The most significant change is the removal of Gen Ali. Human rights and security analysts say he was the major obstacle to reform. His replacement is the respected Mathew Iteere, who used to command the elite General Services Unit - the feared police shock troops often called in to control civil unrest. But if Gen Ali was an obstacle to reform, analysts say he also blocked political interference. It is not clear if the new leadership will have the strength to do that as well or if they are indeed part of a genuine attempt to reform the police. But it does seem to be a good start.